Dr. Stan Teply has had an extensive and varied career in transportation engineering and municipal management, industry, consulting, and academia. 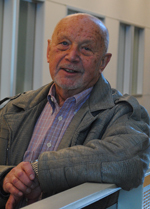 After completing his master’s degree in civil engineering in 1957, he worked at the Czech Technical University as an assistant professor and then joined the city of Prague, first as a transportation engineer, then city engineer and deputy manager of the Institute of Transportation Engineering. During the time of the “Prague Spring,” Stan led the city’s transportation department. After the 1968 invasion of Czechoslovakia by the Warsaw Pact forces, he emigrated to West Germany, where he restarted his career in the traffic control and electronics industry. He later worked as a consulting engineer and director of a traffic and software consulting company in Munich. In 1973, he moved to Western Canada and worked as a senior transportation consultant in Edmonton, Alberta. In 1974, he was appointed associated professor and, in 1977, he became a professor of transportation engineering at the University of Alberta. In 1999, he became professor emeritus. Stan authored or contributed to 13 books and other separate publications (including the Canadian Capacity Guide for Signalized Intersections), wrote more than 100 papers in journals or conference proceedings, taught more than 40 special seminars for practicing professionals in Canada, the United States and several other countries, and made numerous presentations. He also reviewed many masters of science theses, doctoral dissertations and papers. He was a member of the Committee on Highway Capacity and Quality of Services of the Transportation Research Board, and since 1996, served as coordinator of system-wide and multi-modal issues for the 2000 Edition of the Highway Capacity Manual. He has a long history of involvement in NCHRP and TCRP panels. As a member of ITE from 1971, fellow from 1973 and life member from 1999, Stan has been very involved in many of ITE’s activities. He was the founding president of the Northern Alberta Section in 1976–1977, a member of several ITE International Committees and member or chairman of several ITE Canadian committees. During his career, Stan received a number of awards and recognition, such as the 1991 Transportation Research Board Grant D. Mickle Award for an “outstanding paper in the area of operations, safety and maintenance” co-written with A. Jones, one of his students; the University of Alberta’s “Recognition of Excellence in Undergraduate Teaching” in the Department of Civil Engineering in 1984; a nomination by his students for the University Rutherford Teaching Award; Alberta Association of Professional Engineers’ recognition as one of the leaders of the Edmonton LRT project in 1980; and several International and Canadian ITE certificates of recognition. The Canadian Institute of Transportation Engineers presented the prestigious H.R. Burton Distinguished Service Award to Stan in 1997. In 2002, Stan received an honorary doctorate from the Czech Technical University.